There’s a great divide in my boxing gym at the moment. On one side are the nerds. These are the learners. They’re constant students, always analyzing and thinking. They’re all about finding the best techniques and perfecting their skills. On the other side are the brawlers. These are the tough guys. They’re not afraid of getting hurt, in fact they might even like it. They’re all about fighting and beating up people. Clearly some of these guys will never get anywhere, where the others will likely become world champions. But which is which? These are the technicians. They’ll drill every technique until it’s perfect. Hell, even beyond perfect. They discuss hours upon hours of the best technique possible and then practice it all day long. They’ve watched every video possible of all the old time greats and can recall every verdict and timeline of boxing’s past champions. The nerds are more than just perfectionists, they can even teach the technique, and in several different ways. Total opposite of the nerds. These guys just wanna fight, and by “fight” I mean smash somebody’s face in. Their greatest attribute is their confidence. They aren’t worried about fear, conditioning, or even strategy. They don’t care about being in shape or having the right technique. They’re anxious to get in the ring and will spar even before they learn the jab. Brawlers learn to fight through ring experience, not training. Their body learns to naturally adapt to things and while they can’t explain what they’re doing, they do it just fine. It’s too bad they won’t sit down and put more discipline into their technique drills, technique would make the biggest difference in their sparring. But of course, brawlers are so tough they get along just fine without technique. Brawlers aren’t always wreckless overly aggressive fighters, sometimes it’s just their over-confidence that keeps them from being curious about learning better technique. Brawlers are also notoriously bad listeners. There’s no greater pet peeve to a trainer than a fighter who won’t do what you tell him. So Which Is Better? Being a Nerd or a Brawler? I call the 3rd group of fighters “combat athletes”, they’re a perfect blend of both nerd & brawler. Combat athletes routinely step into the ring, but also train regularly to hone their skills. Without a doubt, these guys take fighting seriously. They train hard but understand the point of training is to fight. They’re almost always competing athletes. When you have great skills and love to fight, competing seems like the most logical option. Technique is important, but so is using it. 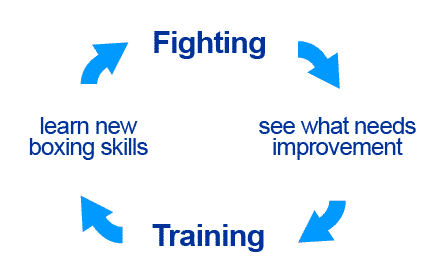 Ultimately, technique and fighting are 2 continuous parts of the boxing cycle. To fight better you need technique; to have better technique you need to fight. Balancing these 2 components of the boxing cycle puts you in an upward spiral of constant improvement. Unfortunately, most fighters I see are either one or the other. They either don’t fight enough or don’t work on their technique enough. They’re still good at what they do, but they’re not improving at their full potential. I’ve gone through both phases myself. There were months when I sparred everyday and did minimal technique work. I got comfortable fighting but I wasn’t getting any better. At best, I was having fun and recording crazy sparring videos to show my friends. Then there were months when I drilled heavily but avoided sparring. The new skills never developed into body memory because I wasn’t sparring enough. In my personal opinion, most folks actually don’t do enough of either. Most guys I see in the gym don’t do enough sparring and don’t do enough technique either. Their time is usually wasted on conditioning. I see most guys spending about 1 to 2 hours on conditioning, then 30 minutes technique (if even that much) and then only 15 minutes sparring (at most). I understand the need to be in great condition but you should also focus on improving as a fighter. Look, anybody can get in shape, it takes years to develop skills. The schedule that worked best for me was ramping my sparring up to 1 hour per day. At first you’re like WHAT?! ONE HOUR OF SPARRING??!!! It’s not that crazy, give me a second to explain. When I first arrive at the gym, I warm up using light sparring with a beginner. He’s working his jab and I’m working my movement. It’s easy work, very light and relaxed. I’m start my day off quick by thinking like a boxer. Punches are being thrown at me, so my mind switches to fighting mode instantly. After 3 rounds, I’m loosened up and I do my shadowboxing and jumprope, stretching etc. 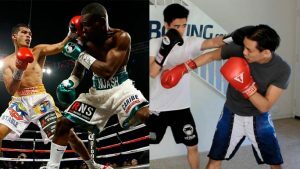 I go through the conditioning stuff (mitts, heavybag) and jump into the ring for real when my sparring partner is ready. Before I get in the ring, my trainer has something for me to try. Once in the ring, I get technical/strategic adjustments from my corner and work hard to outthink/outbox my opponent. After 3 to 6 rounds, sparring is done and I talk to my trainers about what skills need refinement. This time I’m really warm and do slow sparring for 30 minutes straight, no breaks. By slow I mean like 50% speed or even less, nobody gets hurt. The trainer will yell out adjustments as we spar. Me and my partner can adjust each other as well telliing each other what we see and what to look out for. Sometimes we purposely throw the same combos over and over to help each other drill our reflexes better. We’re going easy so that we can spar longer and work on new things. Nobody is afraid of taking hits because they don’t hurt. When we’re finally done, everybody hugs everybody. Awesome day..everybody’s learned a lot, refined it through sparring, and learned a whole lot more than the nerd that hit the bag all day or the brawler that gassed out after 3 rounds. Just remember that we’re all combat athletes…it’s a constant cycle of training and fighting. Where does conditioning fit in? That’s the easy stuff, you just do it. 100 crunches, 1000 crunches…whatever it is, you just do it. Anybody can workout and get in shape. Being in shape is the easiest and bare minumum aspect of being a fighter. The nerd, the brawler, or the combat athlete? Style-wise, I’d probably be classified as a brawler, but I’m very much a combative athlete in regards to this artical, I don’t think it’s possible for the two other groups to be competitive at higher amateur levels. Total reality check when it comes to my boxing approach. Even though I try and spar as much as with beginners and mid level fighters at my gym; I see myself obsessed with the techniques. This slowly has led me to be a boxing nerd who is fairly good at hitting bags and movement. But during fight, when survival kicks in I use the “jab-my way out and counter” to escape the onslaught of brawlers. Now I want to learn how to make someone pay for their mistakes in the ring. But I need to be able to apply my research strategies in a fight which means more sparring. I need to spar beginners at my gym… but here in Australia… the whole WARRIOR feeling has infected everyone, all the way from beginners to good fighters… which leaves us with cuts and bruises all the time. Hope more gym discipline is applied by my trainers who hardly care about boxing as they are Muay Thai Pro’s. Everyone wished they had a perfect trainer, gym and a Joe-Frazier left hook to the body… but hey, we gotta work with what we have. Thanks for the article Johnny. Note: A boxer’s life in a week… in terms of training and resting up would be a great addition to your already excellent boxersite. Great idea, TJ. I’m already putting it together in my head. Mate you said you want a gym that cares about boxing, you want a perfect trainer gym and joe fraizer left hook, check out this gym, Dundee kim south korean a world class trainer and cares about his boxer he wants smart skillful and strong boxer. he likes to train ppl from ground up as there easier to breed, so whatevr you learnt forget cause dundee is the best in australia and will be world regonised. check it out my friend trust me, im thank god everyday that i found this gym, i wanted to take fighitng seriosuly, i train in MMA for two yr they never took me seriously, i looked for a gym and this was the next gym i found i fell so lucky. http://www.brisbaneboxinggym.com.au/. He train corporates clients etc as well and the thing is with them he even teacher proper boxing skills to them not just giving them a cardio workout. dude trust me if your keen come here. Thanks for the quick tip brother. Definitely sounds like a cool boxing gym with a pro at helm. Heaps of respect to Kim’s training and padwork skills. Would love to visit then gym when I come down to Brisbane. Unfortunately I’m locationed in Melbourne. Thanks for the tip man. Have a good day. I would also suggest his gym to my Brissy mates. Hey TJ where abouts do you train? I live in Melbourne also, I’m at a boxing gym called boxingfit (highpoint) but it’s more focused on conditioning and cardio, there is borderline no focus on technique/sparring so I’m thinking of changing. Do you by any chance live in the westside? I absolutely love this site. I disagree with the overall definitions though. I consider myself a “nerd” (never heard that term used to describe a tactician but so be it). That doesn’t mean that I can’t or a “NERD” can’t slug it out either. I think part of the problem is with our instant gratification culture why there are so many professional fundamental flawed boxers. Case in point. Thomas Hearns and Marvelous Marvin Hagler are each great boxers(literally). Marvin’s timing was unreal and Tommy’s ability to adapt into a boxer with his excellent jab delivery and ability to hook from it as a big man was unseen at the time. Yet when they fought each other (you know the answer to this) it was absolute controlled madness. The punches they threw with AWFUL intentions were still fundamentally correct.. Two more examples, Ray Leonard is none as an excellent boxer but see how he had to abandon that to beat Tommy in their first fight and turn into a fighter. Addtionally in his first fight with Duran, he showed he “can fight” but lost to a guy who could “FIGHT” beater than him that not. As this ties into US as recreational boxers, amateurs, ex professionals, etc (whatever you may be). There’s no Black and WHITE to either. “NERDS” arent’ always focused on others without correcting their flaws. I know for a fact that I watch videos of myself looking for flaws. Brawlers aren’t always guys with BAD technique either. I think the one distinction thats missing in this evaluation is something that takes a while to learn and not that common amongst boxers (pros) nowadays whatever their style is. Thats, THE ABILITY TO ADAPT. If you’re a tactician guy, can you ADAPT to a guy who’s JUST as adept at boxing fundamentals as you or can you change the tide. Change your pace, fighting style etc. If you’re a “come forward” use your head for defense guy, as the guy is tagging you, scoring points. Can you change your style change your style to absorb less blows? Because even though the may not hurt you. A shoe shiner if as a brawler you can’t cut off the ring can easily out box you. Awesome comment, Reem! I agree with you 100%. I think I should have been more clear. The words “nerd” and “brawler” weren’t meant to be taken literally. I wasn’t trying to imply that nerds couldn’t brawl or that brawlers couldn’t box. I was simply describing the two main divisions at many boxing gyms today. It is simply to show the different mindsets and how they approach training differently. What they’re capable of and how well they perform is an entirely different matter. With a beautiful sport like boxing, nothing can ever be black & white. Judging from your well-versed comment, it looks like you belong the combat athlete category. Thank you. Johnny, keep up the awesome work. I’ve learned a ton from your site. My critique was an “OVERALL” critique and maybe I got some pent up angst,lol. Its just that I see with so called “boxing fans” who don’t know the sports nuances making comments like “tv friendly fighter” which would translate into a brawler vs. a tactician which in their minds translate into “BORING”. Neither of which is true. One more aside is that I’ve said that the fighters of the 80’s & 70’s save for Tyson and Meldrick Taylor would be deemed as boring frankly. Ok that aside. Now you’re points are well taken. I hit submit accidentally. What I was going to say is that one thing that’s noticeable (and I’m not saying I’m NOT at fault either) is that when fighters go to the gym, we often tend to work on the things WE LIKE to do or are GOOD at. Whether thats body work (hooking the bag), timing work (double end and speedbag), slipping (frankly I rarely see this practiced unless forced,lol) etc. I remember hearing something about working out in general where it was said, “women should work out more like men and men should work out more like women”. Basically men love hitting weights and women forcused too much on cardio. GENERALIZATIONS obviously but that can be tied into boxing IMO also. I think brawlers should work out more like fighters that are tactical fighters and vice versa. Unfortunately (IMO) because “BRAWN” tends to rule over logic amongst most boxers (no matter what their style is) most don’t want to try something new . Anyways, keep up the good work. I’ve been wanting to comment on some of your articles for awhile but they’ve been so on point I’ve had nothing to say (not saying this wasn’t ) lol. Take care. That’s very funny how you said that women and men should workout more like each other. I’ve heard that phrase before but for other topics, not training. Either way, conflicting groups of people can always learn more from each other. Whether I’m on point or not, your insights are always welcome. Thanks, Reem. Nice post, I’m someone in their middle but I’m too green to Boxing to be a combat athlete I think. I’ve been Boxing for about 8 months. Style wise I’m definitely what would be called a nerd. I won’t spar at training sessions until I have a strategy in my head and I’ve watched some of the other club members spar. I’m totally a nerd. That’s the beauty of the sport afterall, isnt it? It’s the sweet science! 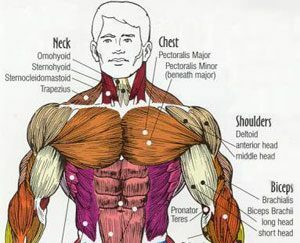 Punching your way through is easy, you only need guts and pain resistance. In the other hand analysing your strategies, defensive techniques, errors and historic bouts need lots of work. It will make you think about it in your bed before you fell asleep and then before you go to the gym and then while you warm up and eventually you’ll have to put it to the test by sparring someone. Trying to be strategic in the ring is really difficult, but someday you will be very thankful for your work. This is what will make you a technician, a sweet scientist. You have to be in the moment 100% in the ring, having to watch for punches all the time, thinking not only how to avoid them but how to react also. That simultaneous thinking requires huge amounts of brain activity, whereas slugging doesnt need a bit because you use only your second nature (the one you acquired through years of sparring, shadowboxing and bag work). Also by watching other bouts you’ll learn the tricks of the game. 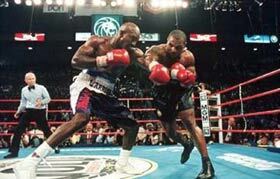 Watching Toney’s wonderful counter punches for instance will teach you the way to do it in similar situations, and with discipline and lots of work you will be able to do it naturally in live time . Boxing needs both aspects. You have to study and then test your knowledge in the ring. If you are not happy with the results try again the next time until you perfect it. And my advice, choose a sparring opponent who doesnt throw hard punches. If you feel safe in the ring you will be able to test anything you’ve learnt! If you’re feeling the tension of a potential knock out punch your insticts will take over and your strategy will fly out of the window. Nick, you said it all! I wish we had more guys in our gym like you. Thank you. I had my first fight after a month in the gym. johnny i have a question. why are some fighters beter then others? is it hard work ,talent, luck dedication discipline or is it a combination of both?? It’s a combination of everything. At the end of the day, it’s part potential and part passion. The people who want it the most will go the furthest. Which one matters more is kind of irrelevant. When you really love something, you find every possible way to be the best. I worked hard to develop my fighting talent, I worked hard to get in shape, to stay disciplined, and to fight to my best. I don’t leave anything out. Johnny, if someone only works on technique and make their form 100% crisp but dont get in the ring and try it out. are they failing to discover their true hidden style? J, the point of having good form is to fight better. So working on technique and form all day without trying it out is like designing an airplane without flying it. The article is simply a hypothetical way of looking at things. It’s meant to open your eyes and see how you might approach fighting differently. Nerd, brawler, or combat athlete doesn’t matter as long as you’re improving in the best way possible as a boxer. I have to say I disagree with your perspective on conditioning. To say it’s the easiest part of boxing seems to be more of an opinion and could apply itself differently to certain situations. I know this is just one acpect of a specific article. You have to be very well conditioned to spar for an hour or more. So I’d say the conditioning should come first and I think it’s something that’s a little under utilized. If you know your conditioning is better than your opponent, it’s just about pushing a pace you can keep while maintaining your technique and incorporating the two together. Look at Lucas Matthysse, or Leo Santa Cruz, or even MMA fighter Nick Diaz. They are always pushing the pace, but in a calculated manner. Conditioning is one of thier biggest tools. They also have great technique, but it would not be even half as effective if they didn’t have excellent conditioning. 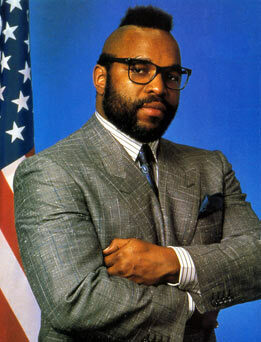 I’m sure Floyd Maywhether has great condtioning, but it’s not part of his style to keep coming forward. He prefers to be a counter puncher. He’s a great boxer, but it’s better to be a boxer-puncher, where your main focus is to keep punching so your opponent will tire. That seems to be the most effective style when you apply it to different opponents. Conditioning and technique could both be improved during sparring; they go hand in hand in a sense. I’d love to see an article on conditioning! Love the site! Johnny,are you brawler or Nerd or somewhere in between? I’ve been through all the phases, many times. I’m a brawler i will engage my partner bait him to exchange, i only go forward even when hit, thats why i get hit a lot. one time I sparred with a boxer i was chasing him the whole round, he keeps catching me when i’m coming in, i will connect 1 punch, then he will connect 3, i got beat lol. New boxer here, 2 months in. I can tell I’m a nerd because I’m a nerd anyway and I am all about getting the techniques correct, why practice something incorrectly? My question is, when should I start sparring? My technique is getting better, but my feet are still sluggish, my balance is bad, and my cardiovascular condition is poor from smoking (I’ve quit at this point). Would I just get demolished due to my condition or would it still be beneficial? To be perfectly clear, I’ve never set foot in a ring. The last time I fought anyone was about 13 years ago in middle school, although I did win those fights due to excellent pain tolerance and middle school boys being buttery little wimps. 13 year old prowess means exceedingly little, though, and that was fighting, not boxing. Start as soon as you can. The most important thing is to go slow. Go at a speed you can handle. If this means “slow motion”, then so be it. Start anywhere and you’ll eventually improve. What matters is that you start. Im difinately a nerd , but I use sparring to see what I need to improve . Everytime Im done sparring I go asl almost everybody atleast like 10 million times what I did wrong . After I ask them if it was either my balance , my balance , my uppercut , whatever it is I work on it the rest of the time im in the gym.Especially if its a punch , I get on the double end bag and punch it with the same punch for aslong as I can before I have to leave . 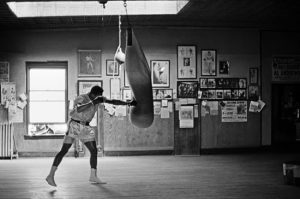 I spend hours looking up different ways on footwork , punching technique , and reading your articles. I record the Pro’s in my gym spar and tell them what they can imprive . And sometimes I wonder if im working hard enough because I dont get tired from focusing so much on technique . Keep doing what you’re doing, Jose. That kind of thinking will get you far! Johnny my first night on the pads i asked if i should use a horizontal or vertical fist when i hooked, that defenetly makes me an nerd i train like a champ but when it comes to sparring i get beat up because my opponent is too aggresive and i get tired while they do not, any tips? Work on your conditioning and your technique. And to some degree, it’s your lack of experience. It’s common to feel this way when fighting against more experienced and more capable guys. I am going to assume you’re in a well ran gym with good coaches. No good coach is ever going to let you spar with more experienced guys and get a beating. What does that teach you? If you feel like your sparring guys with equal ability but always coming worse off try these two little tips below. 1)I used to think every punch will knock me out and therefore i was scared of being hit, even with my guard up! Being hesitant and uncomfortable being hit makes you throw less pucches for fear of being countered. Its very easy to think your oponent is going hard on you. Unless your sparring with a robot you could always ask your partner to go a little easier until you get used to the punches. 2)When under pressure your going to hold your breath. I used to hold my breath when throwing punches. Its a guaranteed way to get out of breath very quickly. Learnt how to breath while throwing punches, it should improve your stamina while sparring. Combine 1 and 2 above and you will see a HUGE improvement in your sparring. Thanks for the tips andy i think i’ll try to spar a lot more and become more relaxed i can only really spar guys that are more experienced, i think i’ll just have to really focus on breathing, i wont’t take too much of a beating though my trainer is good at telling when we’re overwhelmed in sparring. I’m definitely a Nerd for the most part XD I spend way more time talking about technique with my gym mates than actually using them. In fact, the other day, I was actually having a long conversation in the gym about the merits of both vertical and horizontal-fisted punches hahaha. However, I’m certainly on the road to being a Combat Athlete; After warming up some, I’m *always* in the ring for seven or eight rounds at least with several different people. Johnny, is there a link to a site map for your articles on your website? I ask this as I don’t want to miss a post, as I can read through them systematically and in order with a site map, rather than just surf around and maybe miss a few key posts. I don’t have a site map, Kevin. But if you scroll down to the bottom of the home page and click to the next page number and so forth, you will see all the articles. I always want to improve my technique and fight perfectly without doing anything wrong but i still have the heart to fight even when i’m not 100% but i feel uncomfortable in this situation. But the worse thing and the thing i don’t ever do is brawling because i feel too vulnerable.